Amidst flooding, droughts, water conservation and pollution concerns, stormwater management has become a prominent topic across the nation in recent years, with regulations and incentives trickling down from the federal level and making their way into local municipalities. 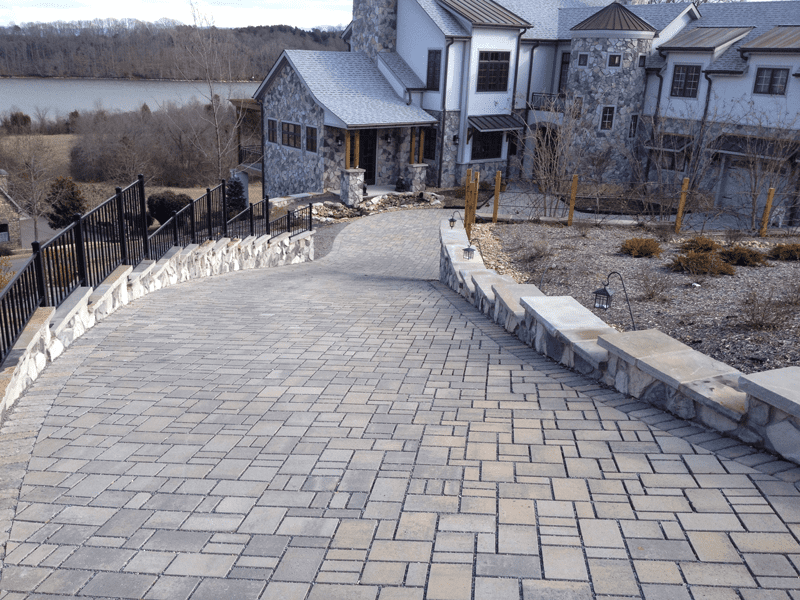 In what initially began as a commercial construction practice for addressing these issues, permeable pavers are quickly becoming a trending phenomenon in the residential arena, as well. For commercial projects, the PermeCapture™ Stormwater Management System combines Belgard permeable pavers with underground Storm Capture™ modules for the collection, treatment and recycling of stormwater. 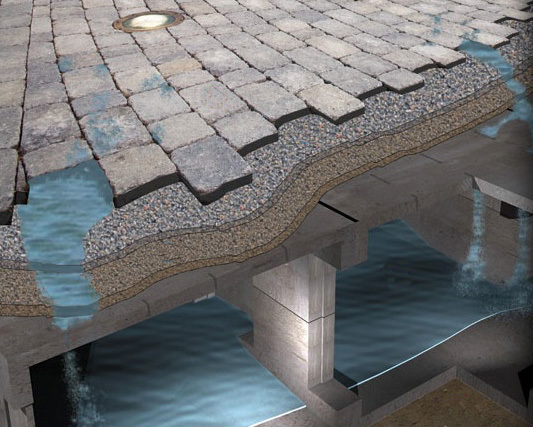 Permeable pavers, also known as permeable interlocking concrete pavement (PICP) systems, have been proven to reduce flooding from stormwater runoff and improve water quality of local waterways by allowing stormwater to trickle down through a gradient bed of aggregate, removing pollutants before allowing water to infiltrate into the earth below. With a number of municipalities across the country also offering incentives to conserve or reuse water, incorporating rainwater harvesting (RWH) into a PICP system became a natural progression. Evidence of this up-and-coming trend can be found in this year’s nationwide survey conducted by the American Society of Landscape Architects (ASLA). Results of the survey indicated that three of the top ten trends in residential landscape design are permeable pavers, water-efficient irrigation, and rainwater/greywater harvesting. 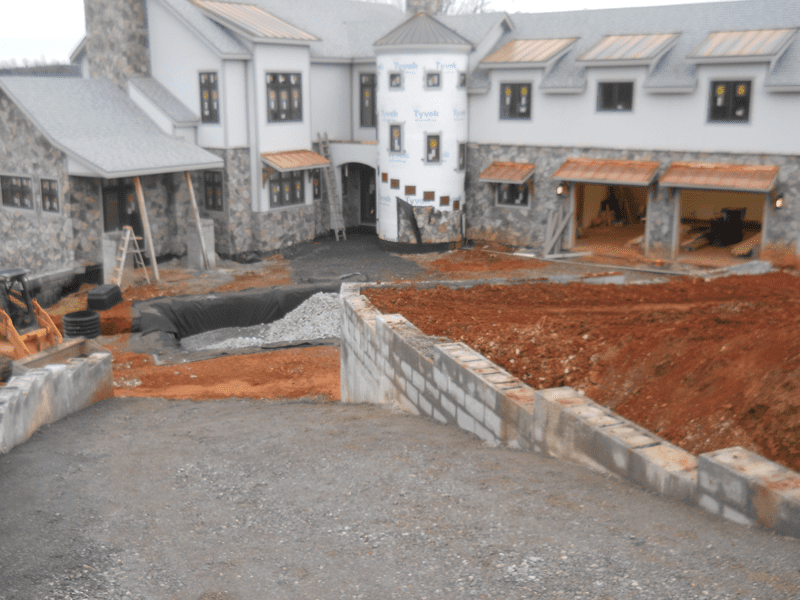 Pierce’s combined PICP/RWH residential project was originally planned as a standard permeable driveway, designed to alleviate potential flooding issues for a waterfront home built into the side of a hill below the street level. “I noticed that the homeowner had other elements to capture rainwater and suggested we do the same with the driveway,” Pierce said, who then designed and installed an RWH system under the driveway that included a reservoir for collecting the water and a pump for landscape irrigation. 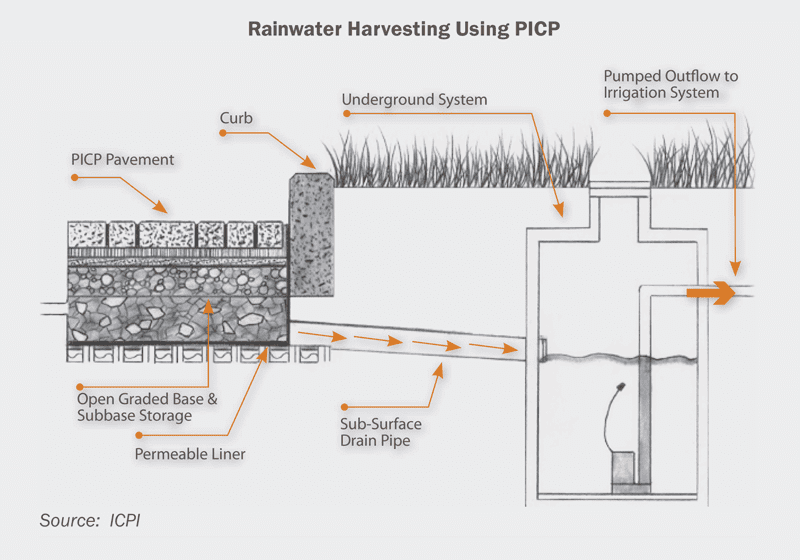 A combined permeable paver rainwater harvesting system is a multi-faceted best management practice that accomplishes the ecological goals of reducing stormwater runoff, improving local water quality, and recycling rainwater for reuse. For a number of years, the U.S. Environmental Protection Agency (EPA) has provided funding for states to finance projects that reduce pollution and provide safe drinking water through the State Revolving Fund (SRF) program. In recent years, many states have begun funding various PICP projects with these low-interest SRF loans. When President Obama signed the $12.3 billion Water Resources Bill into law in June of 2014, Section 5003 of the bill officially endorsed this practice by stating that EPA SRF loans could be used to fund “measures to manage, reduce, treat, or recapture stormwater or subsurface drainage”, not only opening the door for increased funding of PICP projects, but also for stormwater harvesting and treatment systems like the Oldcastle Stormwater Solutions PermeCapture™ system, which is a comprehensive PICP/RWH system that includes a PICP system over a concrete collection vault that can store and treat captured water. With funding trickling down from the federal level, states and local municipalities have begun adopting a number of incentive programs to encourage best management practices (BMPs) that reduce runoff quantity, improve runoff water quality, or harvest rainwater for reuse. Many areas have enacted their own BMP incentive programs simply based on the needs of the local ecology. For example, after four years of drought, unprecedented restrictions on urban water use, and steady increases in the cost of imported water, officials in Los Angeles are now looking at stormwater runoff as more than just a flood risk. In June of 2015, the Los Angeles Department of Water and Power presented its Stormwater Capture Master Plan, an initiative that officials say will reduce the city’s future reliance on imported water, as well as address a predicted trend toward heavier, more intense rainfall in future years. The multi-pronged L.A. County initiative includes stormwater capture, water conservation, recycled water, and groundwater remediation. The Master Plan outlines plans to implement BMPs over the next 20 years to capture rainwater, including rain barrels, cisterns, PICPs, rain gardens, bioswales, and infiltration basins beneath street medians and parkways to capture runoff and stormwater instead of letting it flow out to the storm drains, rivers, and ocean – ultimately contributing to a more sustainable water supply for the entire county. In addition to city-owned infrastructure, the program includes rebates for BMPs implemented at the commercial and residential level. One example of the trickle-down effect would be the “Go Blue!” Blue Community Makeover™ program that began in 2010 in the Diamond Lake Area of Minneapolis, Minnesota. When Diamond Lake received an "F" water quality rating, residents decided to take matters into their own hands. The non-profit group, Friends of Diamond Lake, worked with local contractor, Hedberg Landscaping & Masonry Supplies, to hold neighborhood educational meetings to develop interest and coordinate a program that became known as the Blue Community Makeover, garnering a wave of public support and two environmental awards. "We wanted to do a play on the 'go green' theme that was specific to reducing stormwater runoff and cleaning up the lake," said Tina Plant of Hedberg, who helped spearhead the project. "'Go Blue!' became our rally cry, and residents were proud to display signs in their yards to show they were part of the project." With the help of the Minnehaha Creek Watershed District and local non-profit Metro Blooms, the collective group developed a total of 67 BMPs for 34 households and two commercial projects that garnered over $224,000 in grant funds from the Minnesota Board of Water and Soil Resources' Clean Water Fund, defraying nearly half of the costs for the improvements. In addition to raingardens and water collection and recycling systems, nearly 11,000 square feet of PICPs were installed with the goal of reducing direct stormwater runoff into Diamond Lake by 1.5 million gallons each year. The underground collection basin at the foot of the driveway was lined with a geo-membrane liner and filled with large aggregate to allow water to gather and thus serve as a cistern. The cistern was connected with drainage pipes to an adjoining concrete box that was equipped with a pump for yard irrigation. The aggregate subbase of the cistern was then compacted to allow for standard PICP system installation over it, which includes graduated layers of smaller aggregate to filter out pollutants and aid in water infiltration. Currently, the PICP/RWH trend is developing more rapidly in states with progressive water conservation programs. For example, some municipalities in Arizona offer rebates up to $2,500 for a RWH system, and some areas of Texas are offering as much as $5,000 to residents and business owners. Many municipalities offer RWH incentives, but not PICP incentives, and vice versa. O’Neill also stresses the importance of education and offers a number of continuing education programs to industry professionals on PICP installation, applications, benefits, best practices and LEED credits. “In order to take advantage of all the opportunities that this emerging trend will offer, industry professionals need to arm themselves with knowledge to help both municipalities and property owners see the long term benefits, not only financially, but ecologically,” O’Neill said. The finished Belgard® <a href="http://www.belgard.com/products/pavers/eco_dublin/">Eco Dublin®</a> permeable driveway installed by Hickory Hardscapes coordinates aesthetically with the home’s stone veneer, with the added benefit of preventing runoff from flowing towards the home. 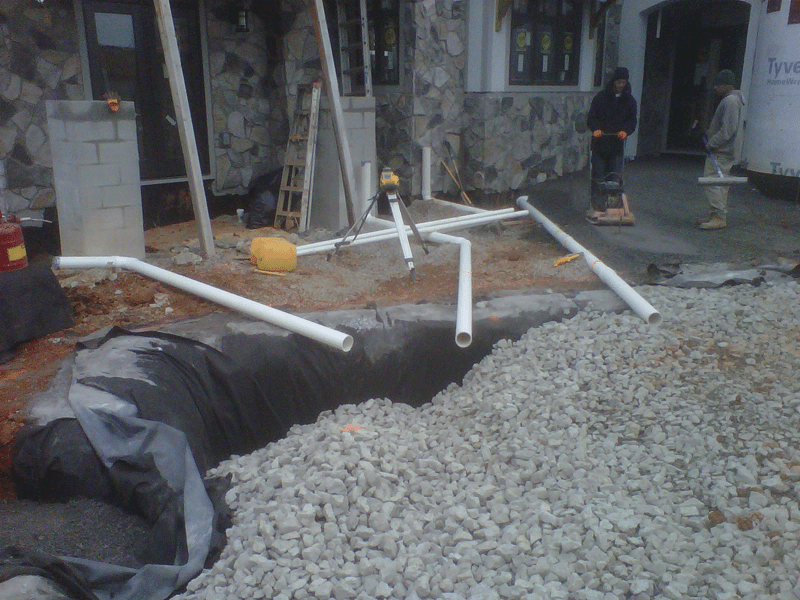 The integrated underground rainwater harvesting system captures infiltrated rainwater for reuse as yard irrigation.